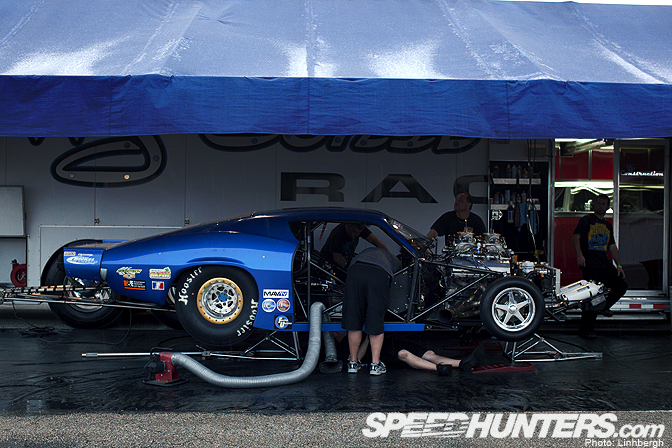 As we are now closing up drag month, let's take one last look at the paddock of the American Drag Racing League's Word Finals at Texas Motorplex. 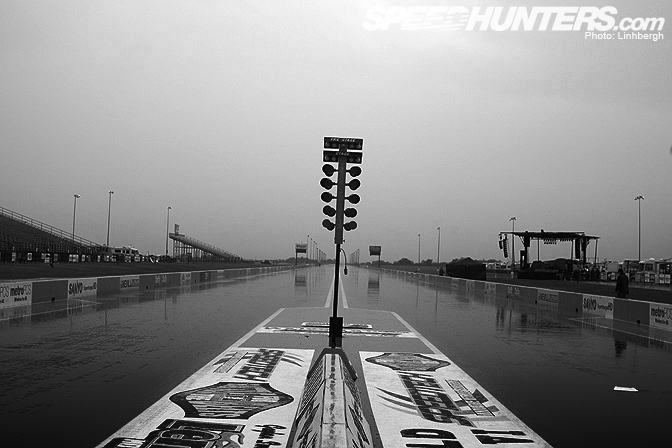 Weather always plays a big role in racing. It doesn't matter what discipline you're into. 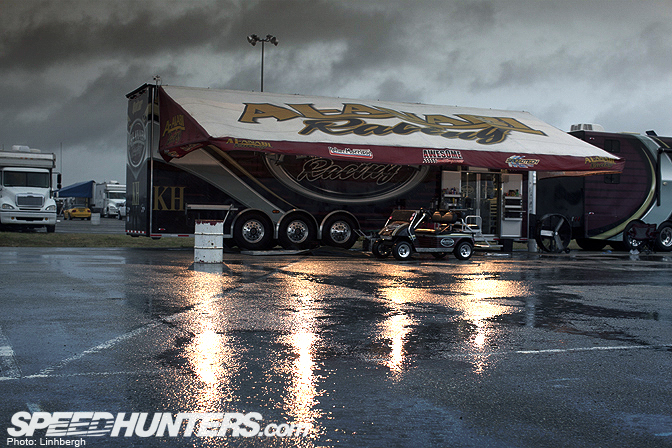 The ADRL paddock was collectively holding their breath hoping the storm would pass the area. 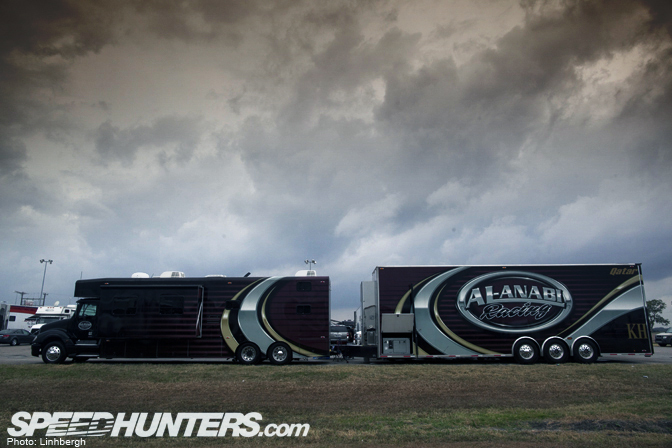 Team Al-Anabi's presence is huge on the ADRL paddock. I lost count of how many different rigs and teams they had out. 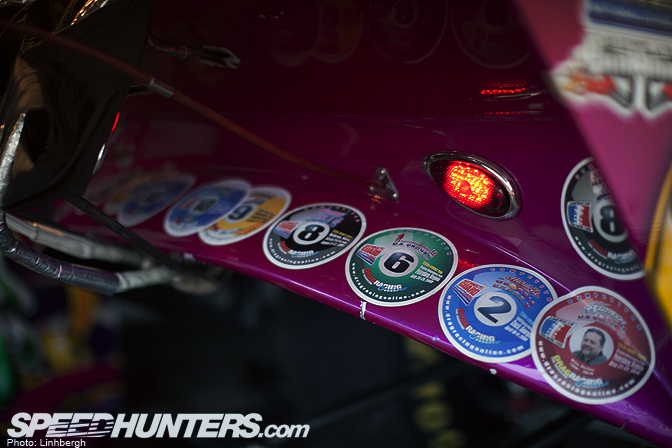 The variety of cars that Al-Anabi racing had was also something to behold. I just love these Camaro SS front ends. Al-Anabi racing is headed by a member of the ruling family of Qatar, Sheikh Khalid Bin Hamad Al Thani, who's goal is to promote motorsports in the nation of Qatar. I'm pretty sure he's succeeded if there are so many different Al-Anabi Racing teams on the ADRL field…. Aside from the Camaros, Mustangs, and Corvettes, the Chevy Cobalt was another popular platform. 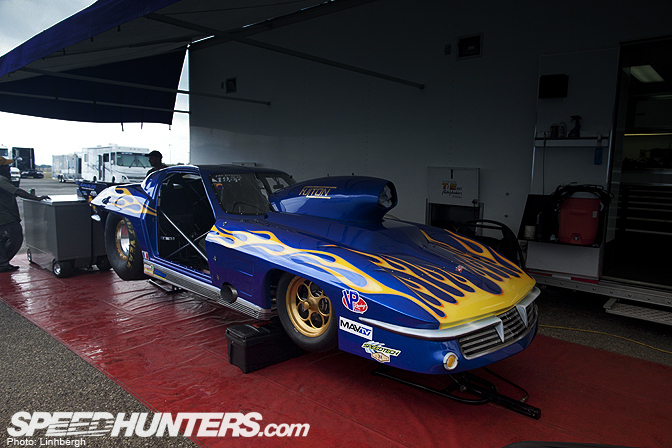 Strange to think that a front wheel drive car would make a good drag car, but it works. Its streamlined body is perfect for straight line speed. I just couldn't ignore the beautiful blue paint job on this door slammer. I just love the sticker bombing all over these cars. This is the flat black 3rd generation Camaro's younger sister. Even the semi-trucks hauling the teams' rigs have tuned engines. Check out the chrome! Here's something Formula D should consider, a belt instead of a trophy! 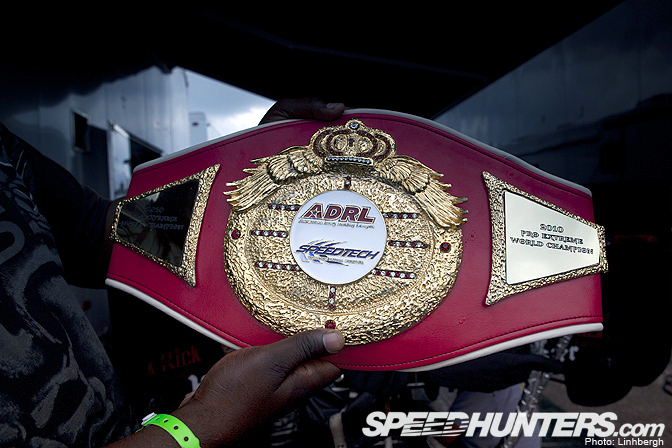 The ADRL competitors are part of point battle the whole season called the "Battle for the Belts." 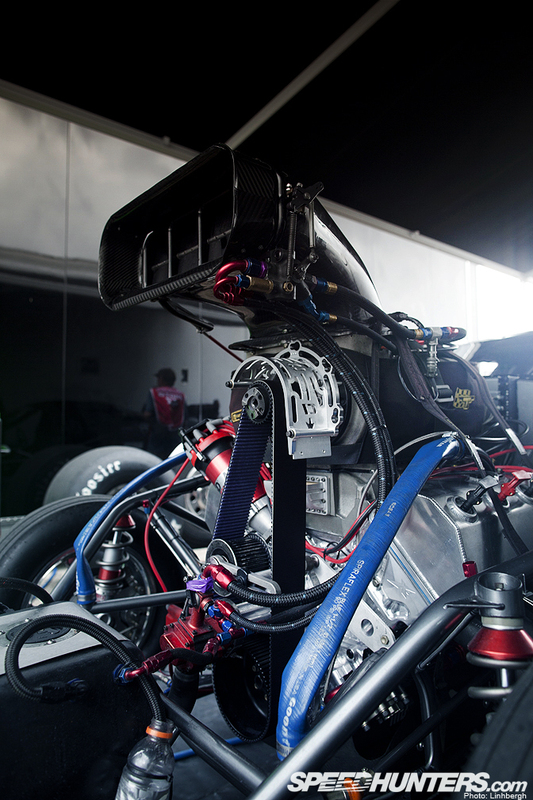 This Dan Millen's belt, the 2010 ADRL World Champion, and also the fastest man ever in Extreme 10.5 history. 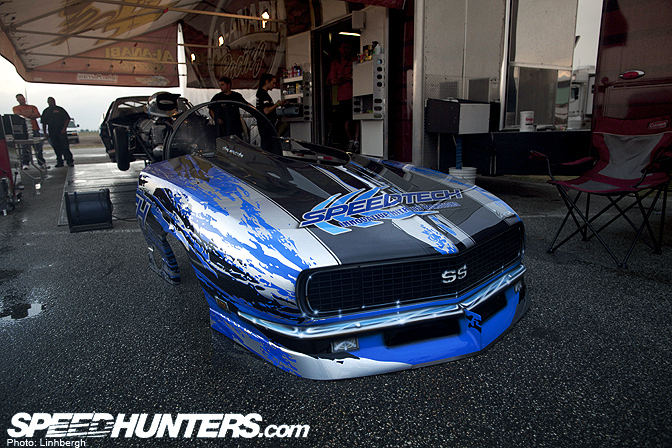 He threw his flat black Mustang across the finish line, an 1/8th mile course, in 3.82 seconds. I'm surprised he didn't create a cross dimensional portal with a car moving that quickly…. 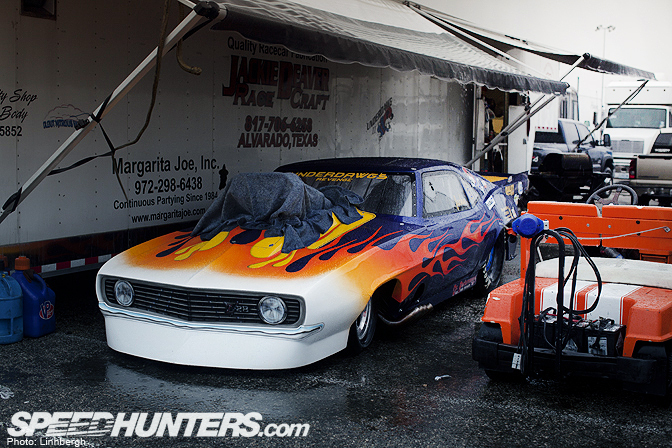 Drag racing is all about the engine. 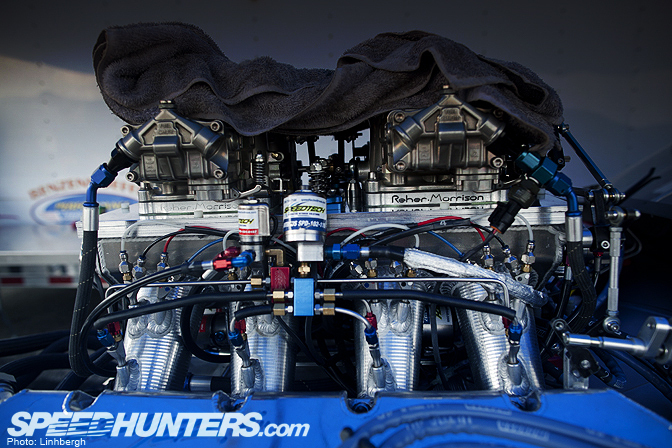 This is the engine that help Dan Millen win the belt and take the 1/8th mile record for the Extreme 10.5 class. 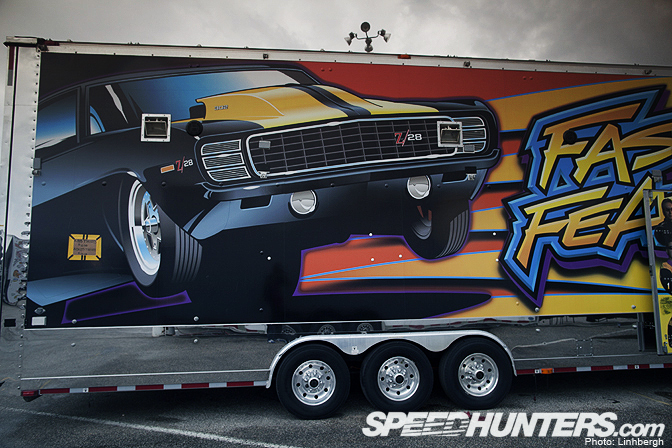 The airbrushed rigs are some amazing pieces of art. 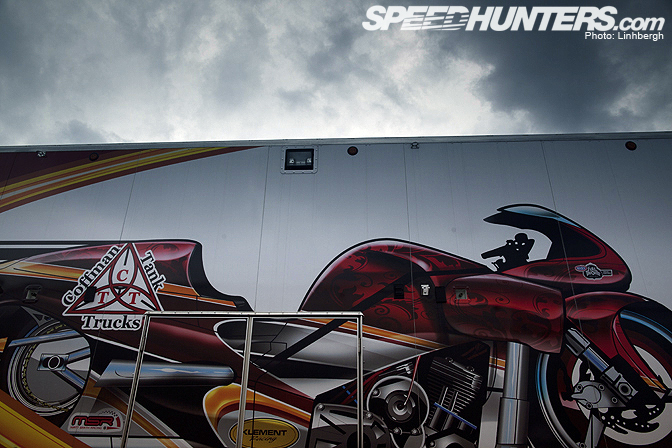 Here's another example of the amazing airbrushing that can be found on the ADRL paddock. 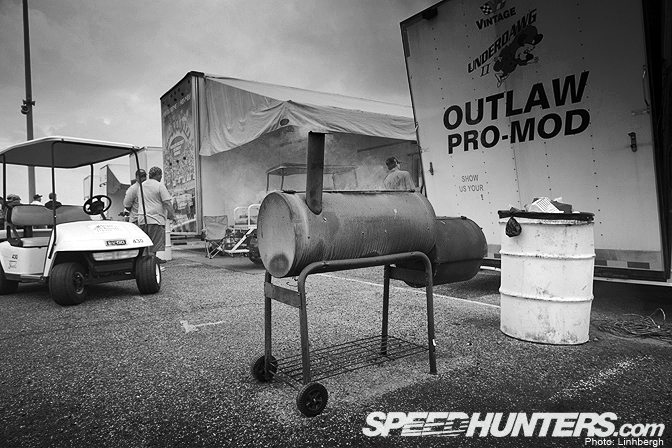 You know someone takes their barbecue seriously when they've brought a smoker to the race track! Like they say, when in Texas, cook and eat like the Texans do! All manner of racers came out from all corners of the globe to compete in the ADRL World Finals. There were come drivers and teams from the UK and New Zealand. The cowboy hat wearing man is from Argentina! I'm not a person that is really into flames on a car, but it works on this Corvette door slammer. The combination of the beautiful blue paint, the bronze wheels, giant hood scoop and super aggressive stance all combine to make one mean looking car. I also like how none of these cars use actual chrome to dress up their cars, but rather, they airbrush. At a quick glance, I do have to say that it works. 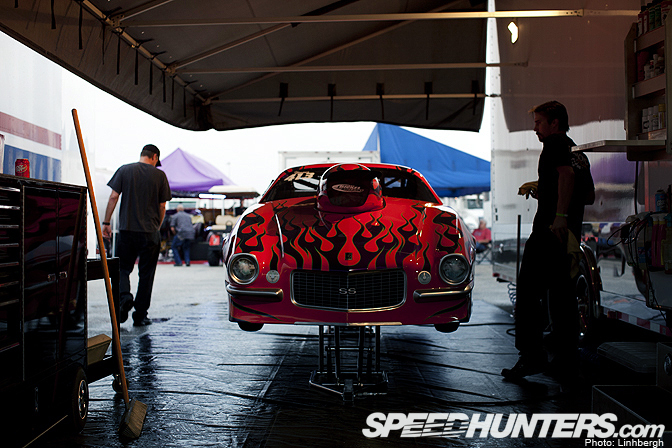 The Formula D paddock is a rare paddock to be a part of. Everyone is close to each other. It's a giant family. And as I walked the paddock at Texas Motorplex, I noticed that ADRL has that same aura and vibe going about it. 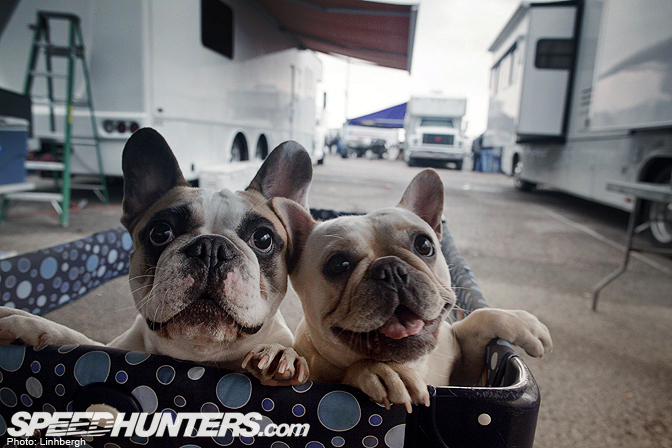 I mean really, you can't go wrong with two cute dogs in a baby pen. The rain was on and off the whole day. There were moments when the track was dry enough that the organizers called the cars to the starting line but each time right as cars are about to go, the rain starts up again. This happened three times throughout the day. 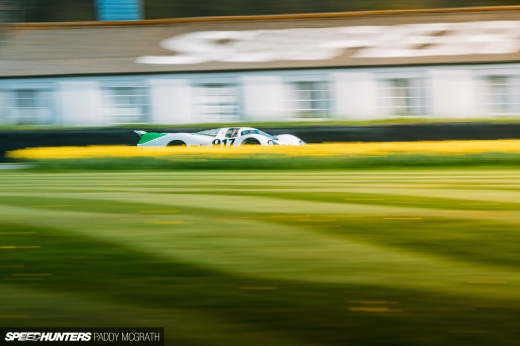 On the 4th time, everything was perfect, the track was completely dry and the clouds didn't look to be brooding. Then the sky opened up. This time, it opened up in a big way. Rain came down fast and hard followed by some spectacular lightning and thunder. With the constant heavy rain, the teams had nothing more to do than to pack up everything and wait it out. It's a bummer that the crowd, including myself, would not be able to see these cars fly down the line. 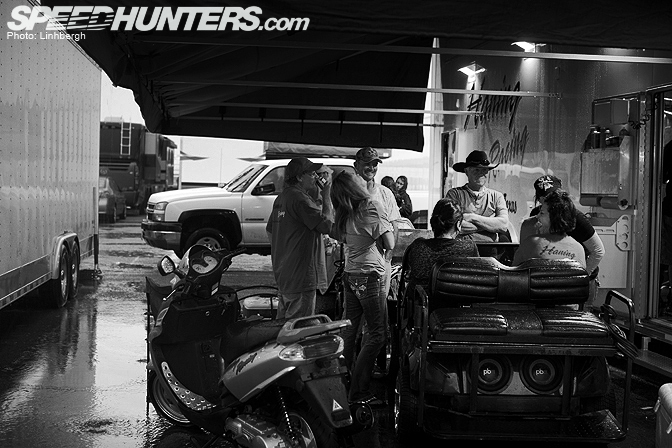 When the teams packed everything up, they hung out in their rigs and trailers. Better than being wet, no? 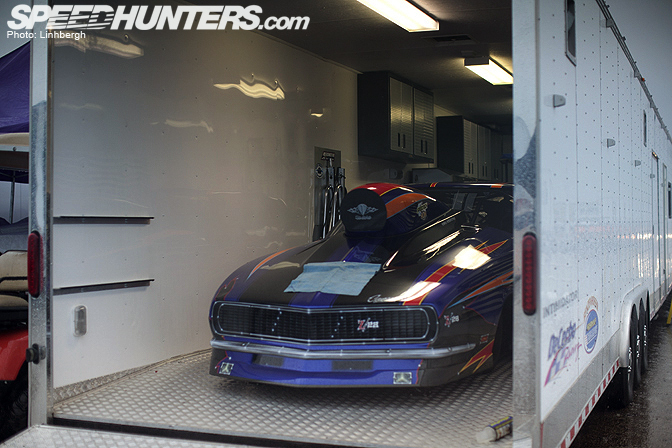 This Z28 Camaro looks as though its a child looking out the window wanting to go out and play but seeing a rainy day. My ADRL experience was a short affair. But I got just enough glimpse into that world to appreciate it. I found one of the most interesting facts about ADRL events is that all the tickets are free. All you have to do is to go to the ADRL website and print out a ticket. At this point, you're probably wondering how ADRL can afford giving away tickets at every round, no? Simple. There's so much interest in the series and so much sponsorship that the sponsors pay for each ticket "sold." Thus, the event is always free. They also stream every event live on the internet. This series is amazing. 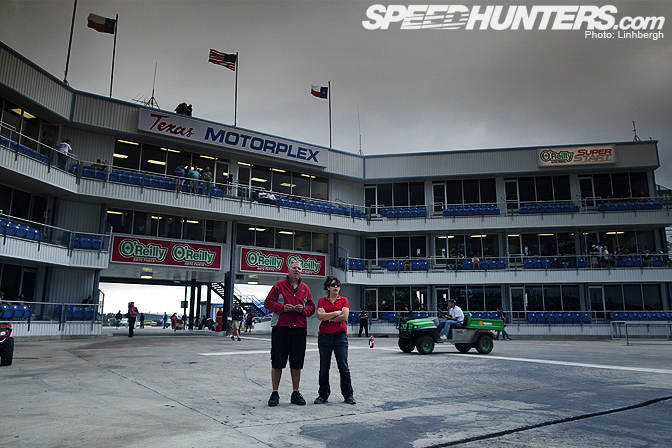 Being at Texas Motorplex and seeing all the amazing cars that the series had to offer was an eye opening experience. Made me appreciate drag racing, a motorsport that I knew almost nothing about prior to this month. 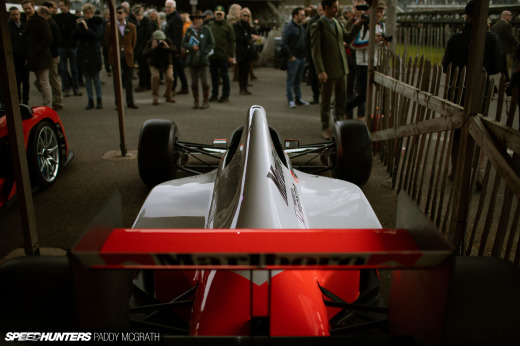 Fast and cool looking cars, that's what being a car enthusiast all boils down to, no? Your pictures never cease to amaze Linhbergh, epicness in every shot! Someone sure loves the burn/dodge in photoshop. It's too bad you were not able to see them race. On the bright side you got a chance to see a lot of cool machines. I would love a wallpaper of the last pic. They were all great photos. No Titan Motorsports 10.5 2jz Scion?! OY!!!! Did you get any good shots? How much horsepower would that semi have after all those upgrades!